Now with a handful of originals on his resume, Elephante‘s latest arrives as little surprise. While the American producer’s remixing pedigree has been well documented, “Age of Innocence” presents a well-crafted original that brings along the talents of Trouze and Damon Sharpe. A soothing indie progressive tone permeates through an original that sets a new precedent for a burgeoning producer. 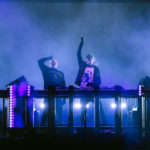 Already touted live during the American’s recent batch of live shows, “Age of Innocence” is the next step forward for a name that already has official remixes for the likes of Penguin Prison, Dirty South, Galantis, and Lemaitre on his resume.